When David Moyes was run out of Manchester United before even completing one full season, it seemed the club had weathered the worst of their post-Alex Ferguson troubles. Louis van Gaal replaced caretaker Ryan Giggs the following season and got Man United back to their usual place in the Champions League. 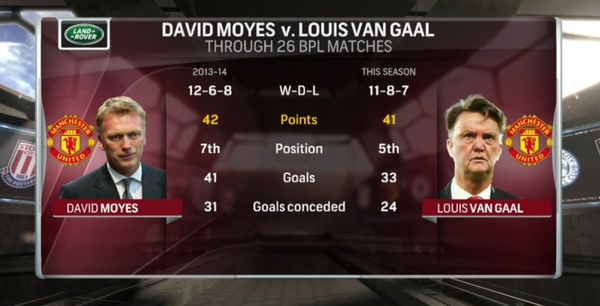 This season, however, Van Gaal has seemed determined to prove that things could have been worse under Moyes. With Saturday’s 2–1 loss to 19th-place Sunderland, Man United are actually one point worse than they were through the same number of matches under Moyes.